The Blackhawk Sling Backpack is a lightweight, single-shoulder bag designed for short trips. 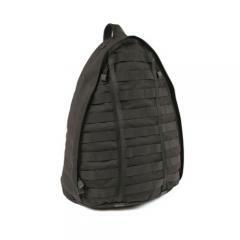 Its 800 cubic inch main compartment features a pair of mesh storage pockets for organization, as well as a water bottle pocket with a cinch cord for security. An exterior zippered pocket provides space for small items, and an internal iPod pocket features an exterior port for threading headphones. The outside of the backpack features extensive S.T.R.I.K.E. webbing, allowing you to attach accessories as needed. The bag rides on a single ambidextrous shoulder sling, complete with comfortable padding and a quick-release swivel buckle. The three-point attachment enhances stability and security for more comfortable carry. On the back of the bag, 3D mesh padding cushions your back and provides ventilation.